Great day photographing Carly & Matt at the wonderful venue The West Mill! An exclusive venue with four floors that has kept all its original features! Carly wanted a simple and classic look to her day and so kept decor to a minimum. Darby & Joan created the styling and Polly & Me supplied the table plan/signage. Carly arrived at the venue for hair and make up in the amazing ‘dressing room’ hosting a ton of old Edison style bulbs while Carly & Matts daughter Ava watched ‘toy story’ on a vintage style leather sofa with a cosy blanket! In between taking pictures we ran around this huge space finding so many ‘photo opportunities’ it was hard to decide on a favourite!! Downstairs the guests chilled out in a huge leather sofa filled room with a pianist creating a very ‘calm’ atmosphere! 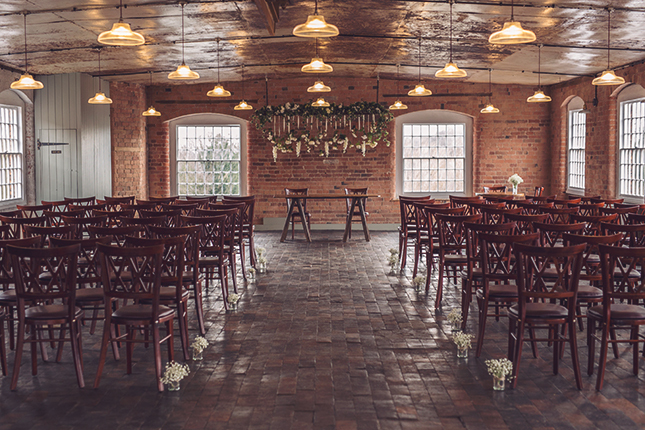 The ceremony was lovely, relaxed and in such a pretty room with a wonderful flower arrangement hanging from an equally amazing metal industrial ceiling! While guests enjoyed canapes and champagne we worked through the group shots and then took shots of Carly & Matt next to the river and in all the quirky places we’d hunted out before!!! And then it was dinner time! We were seated and presented with the some seriously delicious dinner and then it was time to shoot again through the speeches, celebrations and toasts! Up another floor, and we were with the band in a room featuring an old American style bar/diner and once the band started playing we were blown away! Retro music, retro clothes and retro equipment and a guy who sang so good the dance floor was constantly packed! Photography made easy in this venue and we had so much fun it was like being a guest! 🙂 Congrats Carly & Matt, what a lovely day to remember.